Elizabeth Berry is well remembered on the Island as former board member and president of Bainbridge Arts and Crafts, as well as for her friendship with a wide circle of diverse Island personalities. Over the course of two decades, until her premature death from cancer in 2004, Berry could be found most mornings at Pegasus Coffee Shop, meeting friends and solving the world's problems over a cup of coffee. Berry and her husband Dennis Berry also owned and operated Bainbridge House Bed and Breakfast. 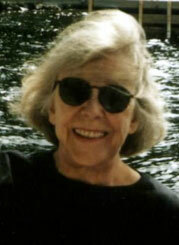 In 2002, Berry wrote Inn Sight for which she received Malice Domestic's award for 'best unpublished work by a writer of a traditional mystery'. Kate Holland, intelligent, single, and attractive, owns a B&B with a cottage garden on Bainbridge Island. One day, aboard the Seattle/Bainbridge ferry, Kate meets widow Kevin Wald, a lecturer in Women’s Studies at a local university. His sad story overrides Kate’s initial reluctance and she invites him to join her coffee group where he is wholeheartedly accepted, especially by her good friend, Bitsy. With Kate’s introduction, Kevin moves easily into island life. But soon Kate's intuition tells her that something is very wrong. 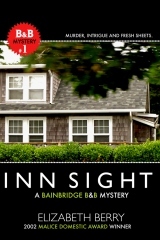 Berry's Inn Sight was published posthumously in 2010. For more information on this book go to http://murderprose.com/MurderProse/Home.html.